A poison-ivy infested tree just fell right across 1/2 of our established vegetable garden. The tree was removed by landscapers but how safe are the vegetables below where the tree fell? 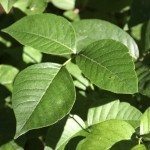 Is it possible to remove poison ivy residue safely from vegetables growing in the garden? Rainwater should do the job for you, but to be on the safe side, I'd wash the vegetables thoroughly with mild soap and water before cooking or eating raw.